With its sweeping palm lined driveway approaching the ornate reception lounge, first impressions of Serene Pavilions guarantee a lasting sensory treat. Geometrically shaped carp and lotus-filled ponds create the impression of a floating palace, and this heavenly vision carries through the vast gardens to the waves of the Indian Ocean just beyond. Within a 7 acre coconut grove are just 12 lavishly appointed individual Pavilions, 8 of which are magnificently set directly facing the ocean waves, whilst the 4 Garden Pavilions exude intimacy and seclusion within their lush walled gardens. With each Pavilion having its own private pool surrounded by a large furnished deck area, emphasis truly is on escapism and pure indulgence. Providing one-to-one service allows us to invite the Executive Chef to privately cook his signature dishes in the Pavilions and with 24 hour personal Butlers on hand, guests will experience exceptional levels of discreet and caring attention. The Pavilions Restaurant and The Amritha Bar provide a quirky mix of fusion cuisine from around the globe complemented by an extensive wine selection, and is the epitome of good taste. Split levels, exquisite elegance and with every table affording incredible ocean vistas, The Pavilions Restaurant provides an innovative and inspiring fine dining experience. 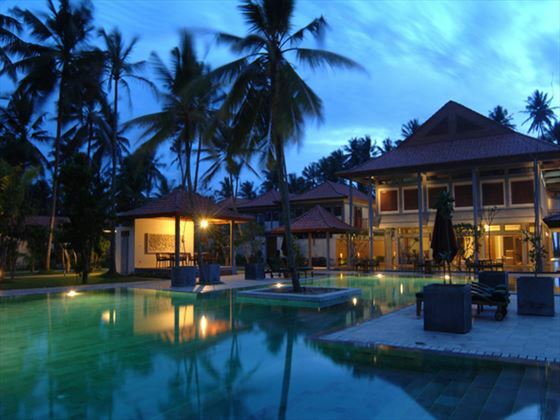 Other facilities within this haven of luxury include an Ayurveda Spa, a large central pool with unique submerged Jacuzzi beds, a library, tennis court and modern gym. Serene Pavilions sets new standards in levels of privacy, comfort, and elegant luxury. 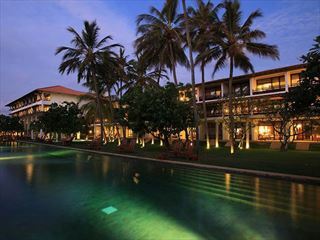 • Best Boutique Hotel 2010 awarded by the Sri Lanka Tourism Awards 2010. 8 x one–bedroom Ocean Pavilions – with a spacious living and dining area leading directly out to its private pool and outdoor living space, each of these 2 storied Pavilions offer direct views of the Indian Ocean and the beachside gardens. On their upper level is the magnificently romantic bedroom and a spacious balcony offering the ideal place to linger over long breakfasts or to relax and watch as the sun sets. A grand marble bathroom with a Jacuzzi, twin vanities and separate shower unit is also on the second level and is reached via a large dressing room. 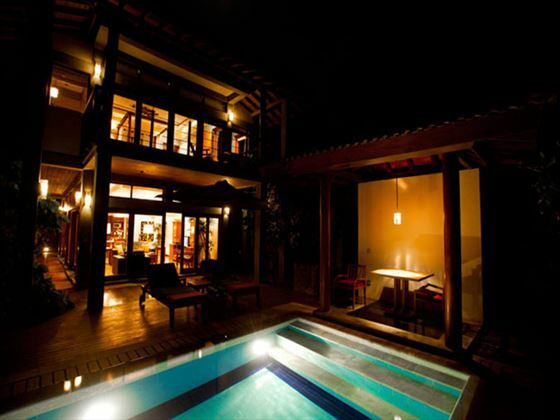 Ocean Pavilions also offer a comfortably furnished study. 1 x one-bedroom Garden Pavilion - this exclusive Pavilion is secluded away behind its walls and promises utmost peace and serenity. 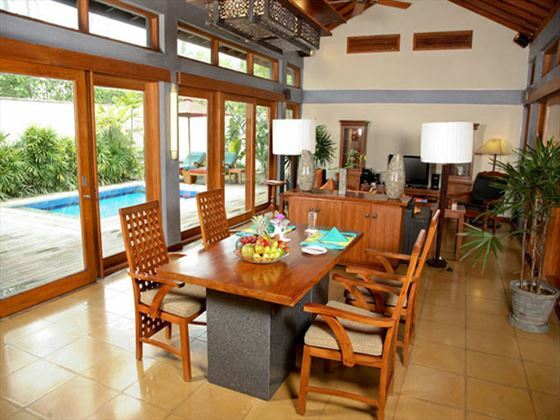 Set on one level, its spacious and airy living and dining room opens out to the private garden and pool area. Its opulent bedroom features a sumptuous 4-poster bed and leads directly out to the tropical deck area where outdoor living can be enjoyed to the full. A large marble bathroom provides a personal Jacuzzi, twin vanities and separate shower unit. 3 x two–bedroom Garden Pavilions - nestled within the beautifully landscaped gardens these Pavilions are also on ground level and offer total luxury, seclusion and privacy. Elegance abounds in the 2 large bedrooms which both open out onto the private pool deck area, which provides the perfect place for outdoor dining. 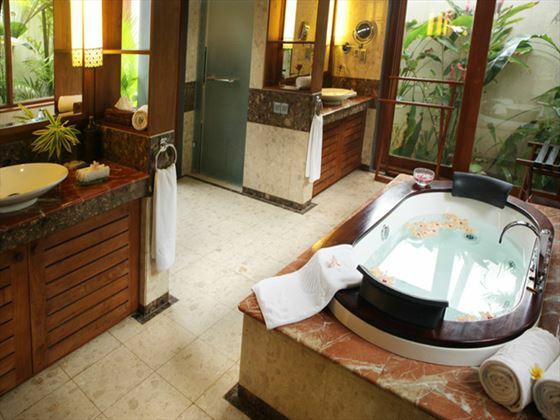 The master bathroom is host to the Jacuzzi and it too has twin vanities and a separate shower unit. The second bathroom has ample wardrobe space and separate shower and WC units. To slip into an even slower pace Serene Pavilions offers ultimate peace and serenity in its Dhaarana Reading Room. Overlooking the central swimming pool and gardens this is the perfect spot to browse through the book selection, play a game of cards, enjoy a boardgame or just take time away from the outside world and sit back and enjoy the view. 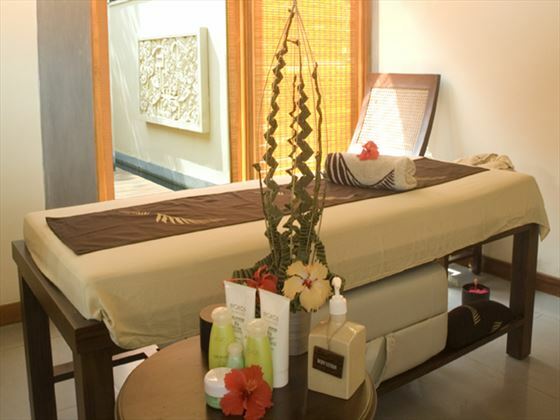 Divine indulgence awaits you in the intimacy of the Serenity Ayurveda Spa where total bliss and an all-over sense of well-being will leave you feeling refreshed and uplifted. Experienced therapists will take you on this journey to inner harmony and outer rejuvenation. The clay Tennis Court is located in a tranquil corner of the beautiful gardens. 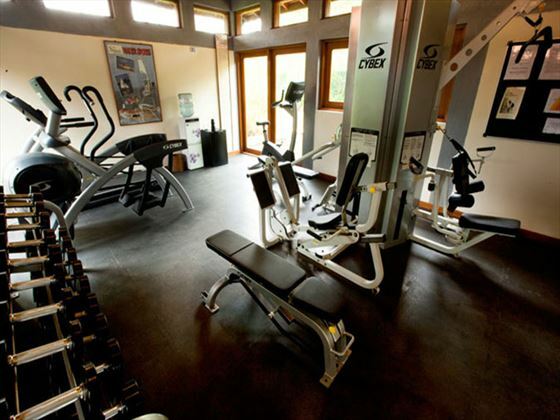 Beat the lethargy with a session in the air-conditioned Asana Gym. With its multitude of modern Cybex equipment, including treadmill and multi-trainer, you can feel the burn after the perfect workout, before cooling down with a cold towel and chilled water. With Colombo’s world famous Royal Golf Course just an hour away from Serene Pavilions, the chance to play this superb 18-hole course should not be missed. Green fees and golf-club hire can be arranged through the Hotel. Sri Lanka ‘s national sport encourages cricket lovers to gather from all over the world and witness International teams play their best at the countries Test Match grounds. Serene Pavilions can arrange for tickets and transport to these unmissable events. 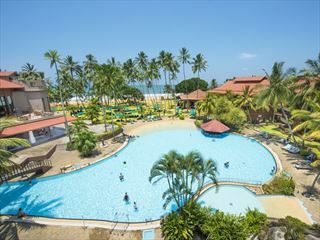 Tailor made sight–seeing private tours can be arranged to visit the best of Sri Lanka’s world renowned historical and cultural sites, such as Kandy, Galle, Ratnapura and even to the famous elephant orphanage at Pinnewala. The National Museum, the famous silk market at Pettah, and the majestic Galle Face Green are just a few of Colombo’s highlights. Serene Pavilions, conveniently situated only 45 minutes away from the city of Colombo, offers easy access to upmarket and exclusive boutiques for those want to indulge in some retail therapy. Books, clothes and home artefacts with a Sri Lankan twist are the best buys. Children under 12 years not permitted. The magnificent central swimming pool, with its 4 unique submerged Jacuzzi beds and stunning aquamarine colours, is bordered by passionfruit-columned walkways which thread through the imaginatively designed gardens. 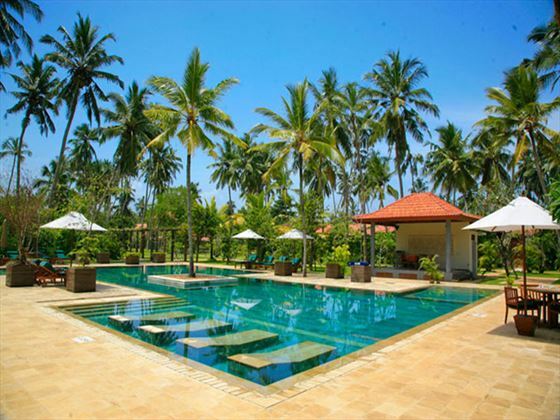 The beautiful lawns and swaying palm trees are the perfect backdrop to a refreshing dip in the gorgeous pool. 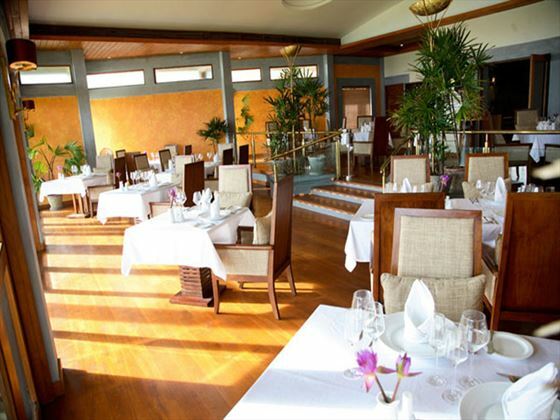 The centrepiece of Serene Pavilions is undoubtedly the stunning Amritha Bar and just above, The Pavilions Restaurant. 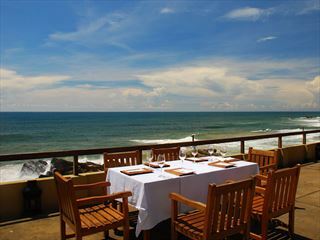 Their direct Ocean-facing location offers not only uninterrupted sea views and spellbinding sunsets, but also provides a mouth-watering array of gastronomic delights in the most refined of surroundings. 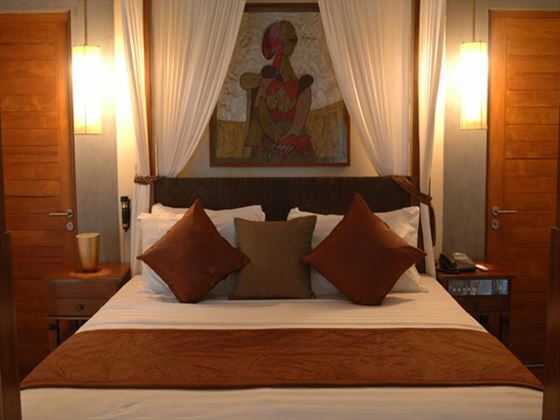 The Amritha Bar will soothe your senses with its tranquil surroundings and its rich textures and earthy colours. Relax in the easy chairs on the garden side deck with the Barmans Shocktail of the Day and be mesmerized by the sun as it slips down to meet the horizon. Also the ideal place to savour your after-dinner drink, and to listen to the hypnotic motions of the waves as they lap gently towards the shore. The Pavilions Restaurant with its refined ambience will tantalize you with its specially created A La Carte Menu. Delight in the culinary expertise of our internationally experienced Executive Chef and enjoy the imaginative flavours of Asian, Western and International cuisine presented with flair and an imaginative twist. Dine under the twinkling stars on the spacious balcony and be enchanted by the sound of the waves running up to the shore, or enjoy your culinary masterpiece inside, in the elegant and gracious dining room where every attention to detail will guarantee a truly memorable dining experience. Their Executive Chef will also provide you with the perfect meal of your choice in a quiet and private setting, be it fine dining in the luxury of your own Pavilion, a sizzling barbeque on the beach, or discreetly by the pool with only the palm trees looking on. For that very special occasion which gives reason to celebrate, be it an Anniversary, Birthday or Honeymoon let Serene Pavilions honour your deepest desire to make your dream come true. Serene Pavilions also has a variety of locations perfect for hosting small and intimate events.